Here I will explain how to change gridview row color based on data in asp.net using c#, vb.net with example or dynamically change asp.net gridview row color based on data in c#, vb.net with example. In previous articles I explained edit gridview row details with ajax modalpopup, show sum of columns total in gridview footer, filter asp.net gridview based on dropdown selection, Repeater Control Example in asp.net, sorting columns in repeater control in asp.net, Display time like facebook/twitter like 1 minute ago, hour ago and many articles relating to gridview in asp.net, css, c#, vb.net and jQuery. 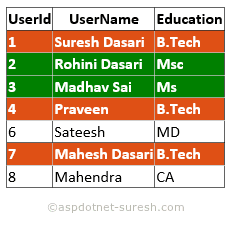 Now I will explain how to change gridview row color based on data in asp.net using css in c#, vb.net with example.